Peter Martin: So that house of ours, it keeps getting bigger.. Does it feel more spacious inside? It should. The Bureau of Statistics says the current crop of new NSW houses are an extraordinary 100 square metres bigger than they were a quarter of a century ago. 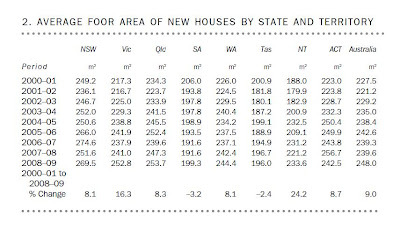 In 1984 according to the Bureau the average new NSW house was around 159 per square metres, giving each of the people in it around 60 square metres of personal space. Since then near-continuous growth has lifted the average new size to 269.5 metres, an Australian record giving each of the occupants an average of about 100 square metres each. It may also be an international record. The latest US figures show the size of new American homes sliding... shrinking from 212 square metres before the financial crisis to 202 square metres in September. New homes in other parts of the world are much smaller, with Denmark the biggest in Europe at 137 square metres and the UK the smallest at 76 square metres. In a special report released with the February building approval figures the Bureau says the average new Australian house is now 248 square meters, and the average new apartment or flat 141 square metres. New NSW apartments are somewhat smaller than the Australian average at 137 square metres, although they have grown 5.5 per cent in size in eight years. The figures lend weight to concerns expressed by senior Reserve Bank officials that we are investing in houses rather than housing. Deputy Governor Ric Battellino told a Melbourne conference in November that almost half of the $250 billion spent on housing each year went on alterations and additions with 1 in every 7 new houses "simply replacing existing houses that have been demolished." Governor Glenn Stevens spoke on the Seven Sunrise program this week about the importance of increasing the stock of houses rather than increasing their value saying his children "within not too many more years are going to want somewhere of their own to live." He has told a business audience he would regard what happened to house prices as a measure of his success saying "if all we end up with is higher prices and not many more dwellings then it will be very disappointing, indeed quite disturbing." The ABS finds new new Tasmanian houses the smallest in Australia at 196 square metres, and notes that in recent years they have been getting smaller. 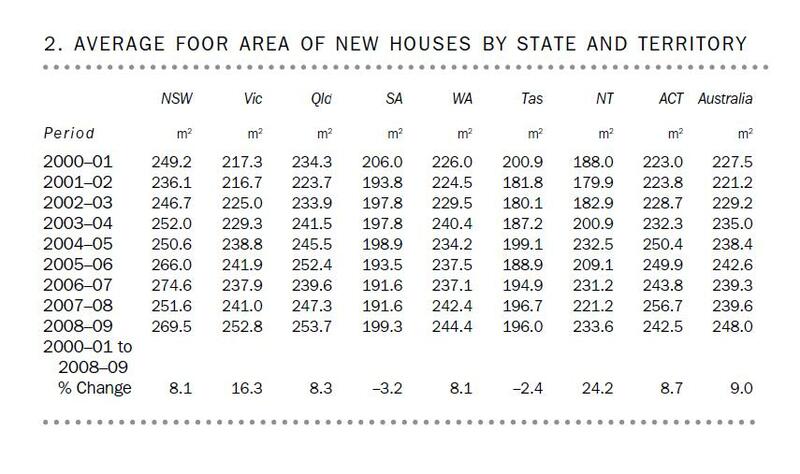 New Victorian and Queensland houses are gaining on those in NSW, reaching 253 and 254 square meters.